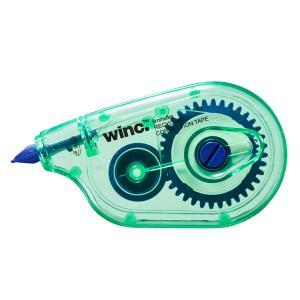 Winc correction tape is made of high quality mechanism, cover-all tape with ergonomic feel and dual-angle head suitable for correcting typing or writing errors. A unique angle grip hold either side-on, or front-on (like a pen), makes correcting errors easier and more precise. The correction tape is made from recycled materials, in fact 60% of the correction tape material is recycled saving our planet from unnecessary waste and pollution. Tape size 5mmx8m.